I am a complete nerd… a total dork. The last time Anthony Bourdain was at the Paramount I actually introduced him to the audience by saying, “I have no idea who Anthony Bourdain is, but the show is sold out tonight and all of you seem very excited to be here.” Honestly, that is what I said. So I left the stage and took my seat and by the end of the show, I was a fan. Kitchen Confidential became a must-read and The Travel Channel’s No Reservations was added to my DVR list. How could I have been the only person in Austin not to know about him? And the wierd part was that he simply stood on stage and told stories and answered questions. Unscripted. Unedited. Until that night, I thought I was the only one who was freaked out by Giada De Laurentiss’ enormous head. So he is back at the Paramount. Sold out show. As popular as ever. 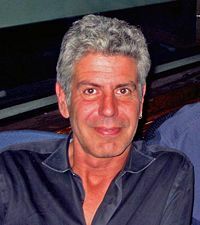 And this time, I can’t wait to meet him, but I keep thinking about a certain episode of No Reservations. I can’t remember what part of the world he was in, but some women spent the day chewing on bark or a plant or something until it became mush in their mouth. Then they spit the juice into a cup and when it was full handed it to Anthony. Even if you didn’t see the episode, I am sure you can guess what came next. So this time when I introduce him, I will know who he is. And I can honestly tell the audience that I am excited to welcome back to the Paramount one of the most unusual celebrities I have ever met. We just received word that the Anthony Bourdaine special that was filmed while he was here will air Friday, November 9 on ABC Nightline. As you know, they can change their minds depending on what is going on in the world, but that’s when it’s scheduled. 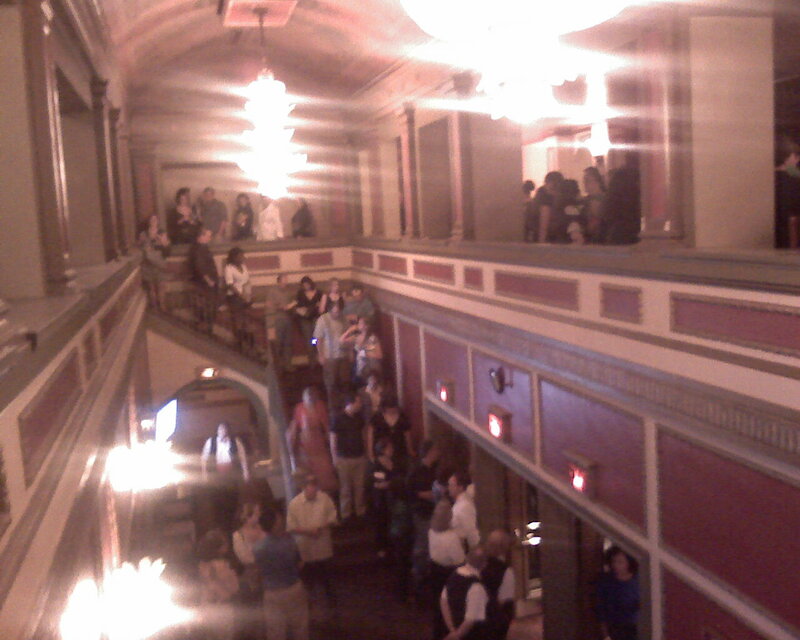 Eventhough I had no idea who he was – it was a great night at the Paramount with Anthony Bourdain. He arrived in town yesterday and had to be back on a plane by 5AM this morning, but while he was here he still managed to do a little exploring. He did a shoot with ABC Nightline at Ruby’s BBQ around 3PM. I called my Programming Director, Lietza, to see how it was going. “What’s he like?” I asked. “He’s everything I hoped he would be” was the reply. At the theatre there was a buzz in the crowd and quite a mixure of people -young, old and in between. I was surprised at the large block of orchestra center seating that went empty. Folks, that is so distracting for an artist to see from stage. If you cannot make the show, call us. We will credit your ticket purchase as a donation and then try to re-sell them. 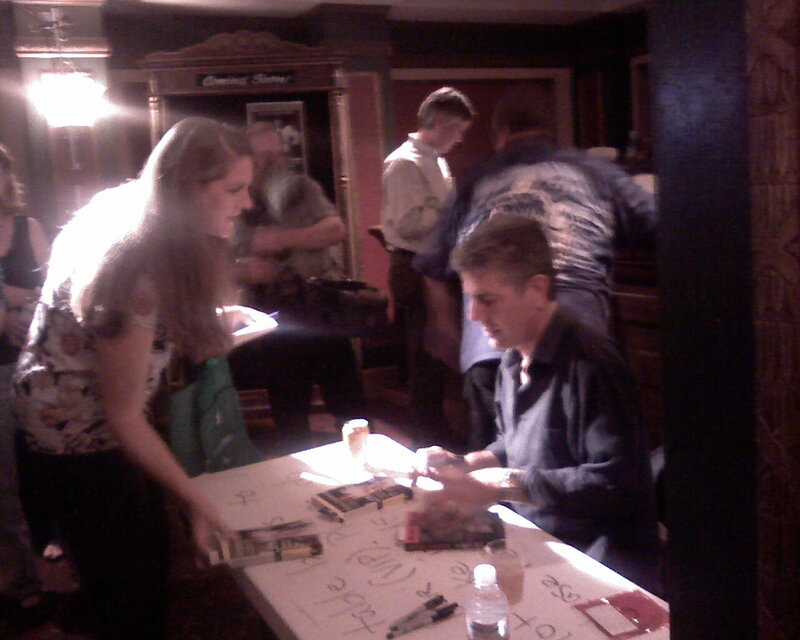 After the show – which went 30mins longer than scheduled – I was shocked at the length of the line for the book signing! That was a David Sedaris type of line. But Tony stayed until the bitter end signing all the books. There were extras that got signed and sent back to Book People if you didn’t get one. By the way, when you buy a book at the Paramount, a portion of your purchase is donated back to the theatre. Iron Works – Nope, but I love their sausage. Salt Lick – Nope, but love their sauce. Pok-e-Jo’s – Nope, but I love their turkey. Stubb’s – Nope. I’ve never been but I’ll be there Thurday for an event. It’s not Lambert’s either but I do like that place even if just a little fancy. If you are in the mood for BBQ on Saturday, head to your favorite haunt around 3ish and see if you run into Tony and the film crew from ABC! Our winning bidder, Pat, has invited our teacher, Victoria, to take one of the four seats for the show. Everyone is excited. Everyone is a winner. Mr. Bourdain is being followed by cameras from ABC Nightline. Maybe you’ll make it on TV if you’re at the show. 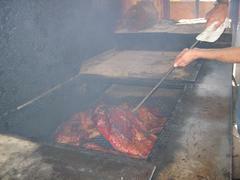 We also know that he is paying a visit to Austin’s “best” BBQ joint… hmmm wonder which one? Take a guess which one, leave the answer in a comment, and if you are right, maybe I’ll send you a little gift. He will be in the lobby after the show to sign books and I believe he is planning on taking questions from the audience. 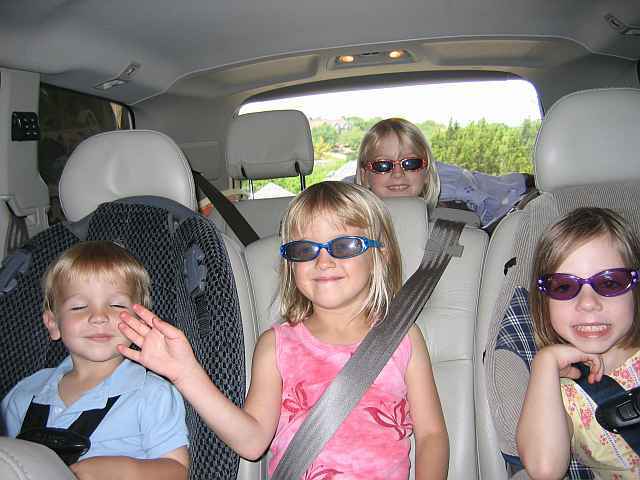 So this weekend I was taking care of FIVE kids all under the age of NINE. Needless to say I didn’t have much time to check in on the blog. 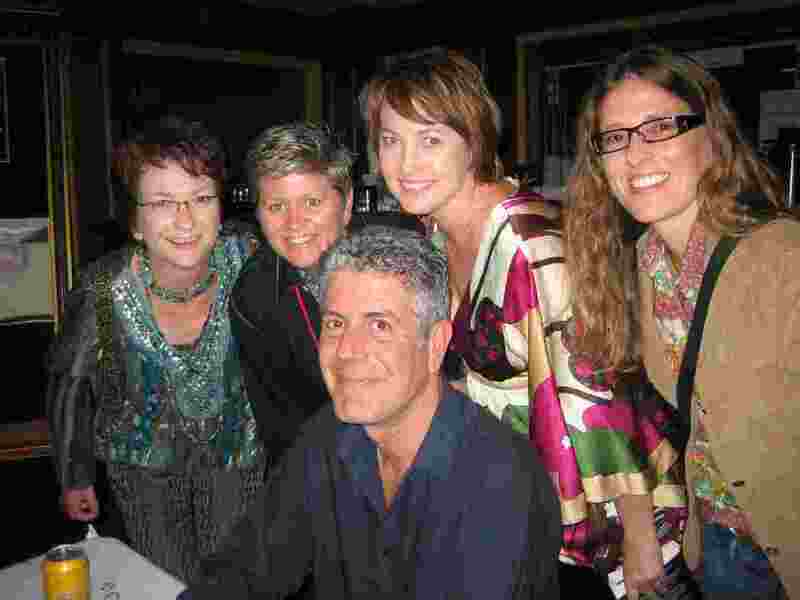 So I am sitting here shocked that we are up to $1,600 for the four front row to Bourdain this Saturday. So Patricia – that’s my Mom’s name – you got us to $1,000 and then Kathy came in with a $1,500 bid. Now you have come back with this amazing bid of $1,600. If this keeps up, I’ll have the new roof at the Paramount paid for by Thursday! Remember, the bidding closes at 5PM on Thursday for these FOUR front-row seats to An Evening with Anthony Bourdain at the Paramount on Saturday- one night only -and it is SOLD OUT. To bid, leave your amount in a comment. I will contact you by email if you win. Winning bid must be confirmed before tickets are issued. The winner and his/her guests will also receive complimentary parking and cocktails. All money supports the theatre. The donation amount less the value of the tickets ($180) is tax deductible. Bid often and bid high! Thank you. 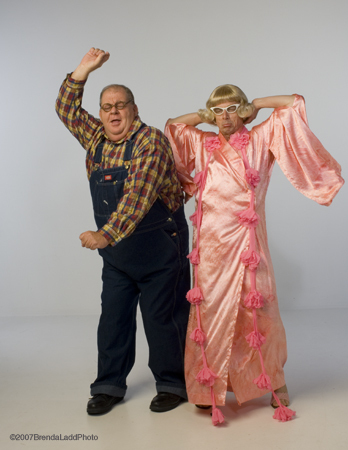 $1,500 high bid… Kathy the great! Well, well, well. See how little I know. Tony is definitely someone I should have known about. By the way, my Programming Director wants me to set the record straight. She booked him almost a year ago knowing that the show would be a hot ticket… she thinks he is “GORGEOUS”. I think Kathy is GORGEOUS for her $1,500 bid!!! So the bidding is off to a fantastic start. We have a $1,500 bid. Just a reminder, these are four front row seats to an otherwise sold out show. And, just to make this worth your while, I’ll add complimentary parking as well as complimentary cocktails for the show. I have no idea what Mr. Bourdain is going to do, but if food is involved it will be like sitting at the kitchen table with him! All bids benefit the theaters. Top bid at 5PM on Thursday gets the tickets to the Saturday, October 20 show. Bid must be confirmed before tickets are claimed. To bid, simply leave an amount in the comment box. We will contact the winning bidder by email. Good luck and thank you to all of our bidders! Comments now closed on this post. Continue bidding on the most recent post.